Each one of the 2S4Y Designers drew inspiration from the special sketch created specifically for this event at 2 Sketches 4 You. As Designers we all worked with a different sponsor to bring you mega inspiration and of course Prizes to be won. Just by leaving a comment on each Designers Blog you will be eligible to win a particular sponsors prize. 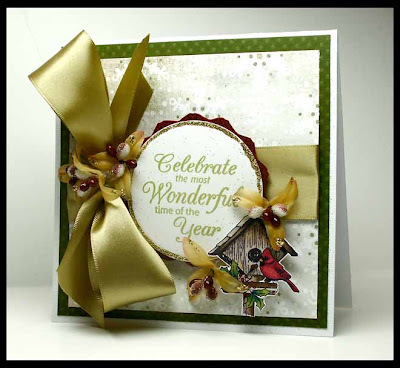 I was fortunate to work with the amazing Christmas Treasures Borders & Centers from JustRite Stamps. 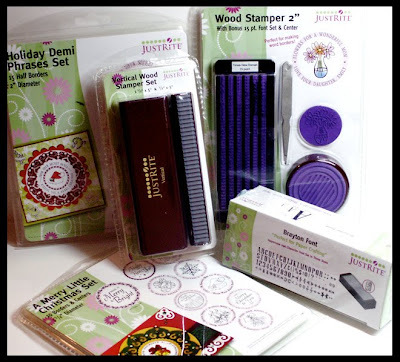 At JustRite Stamps you will find a whole range of stamping products including Monogram Stamps, self-inking stampers, Fonts and much more - personalizing my own sentiments using the JustRite stampers and Font sets is a personal favorite of mine. JustRite has a beautiful gallery for further inspiration and right now you can check out their SUPER SALE for deep discounts on select products. Don't forget to play along with the sketch we created for World Cardmaking Day on 2 Sketches 4 You. We are giving away a Guest Designer spot on our team to one random winner! `WoW` what a gorgeous card kazan.. Thanks for the chance to win some fabulous Candy.. Happy World Card Making Day and greetings from Finland! what a nice candy on such a great day! Gorgeous card (as always!) I have been wanting to start using JustRite Stamps but have to wait until next year to order any. Thanks for a chance to win some. What a fabulous day! Love your card!! Oh, that card is simply stunning! Wow, what a gorgeous card, Kazan! (How are you???) Happy World Card Making Day to you! Your card is so pretty. I love the addition of the cardinal. Your card is beautiful! And what gorgeous ribbon too! Happy World Card Making Day! There are endless ideas on this blog! Amazing talent! Thanks so much for thinking of us....I'll have to check in regularly. That card is stunning! I love the birdhouse!!!! Your card is so stunning!!WOW!! Just Rite stamps are the best, and what a sweet give away! I love your card! Gorgeous! Love the ribbon and birdhouse! Happy WCMD!!! Great card. I love the bow and all the embellishment. Thanks for sharing. What a beautiful, classy card. Loved the ribbon--what an elegant touch. Thanks for the chance to win. You always use the most amazing ribbon! Happy World Card Making Day!! What beautiful cards. Happy World Card Making day to you! Your card is so pretty, and what a great prize. JR products rock. Thanks for the chance to win and Happy WCMD! Man...your work is stunning!! Happy World card making day to you! Beautiful card! I love the big bow. Happy WCMD! Your card is positively gorgeous! this is stunning kazan, LOVE that gorgeous ribbon. Cool bloghop and thanks for the chance with the candy. Your card is beautiful and you did such a good job with the ribbon. WOW! I wish I could tie a bow that good. An amazing card! Stylish and fabulous in every way possible! Great inspiration to me! OMG!!! Kazan I always love your bows...you have a great style with ribbons...Fabulous card. That ribbon is absolutely gorgeous and you sure know how to tie a perfect bow! Great card, thanks for sharing! What a stunning card. Happy Card making day. such a beautiful, gorgeous and fantastic card. I always enjoy looking at your work. Thanks so much for the chance to win a great prize. I might even try to get a card done from the sketch, if I can organize myself. All I have been doing is hopping and organizing blog candy. Holy toledo!!! That's one beautiful card! Happy WCMD!!! Love that luscious bow and the color scheme. That is a beautiful card! I love the cut out details. Thanks for the chance to win! Beautiful work! Happy Card Making Day! Kazan...You do beautigul work! All of your cards are fabulous!! Would very much LOVE to win the fab blog candy!! Your card is beautiful... but that is nothing new! :) I am in LOVE with the Just Rite stuff but haven't had the $$ to buy any yet! This would be fab to win. Thanks for everything you do. Your card is G-O-R-G-E-O-U-S!!! The birdhouse DOES make it!!! Your JustRite blog candy has me breathless - I own 1 tiny set I won from Angela & I'm thrilled, but I NEED more! You can NEVER have too many JustRites, as they are so JustRite for so many crafting projects! I'll be keeping my fingers crossed!!! I love the colors in your card and that ribbom is simply luscious. Thanks for a chance to win! Oh - What a beautiful card, I love your papers and ribbon. Gorgeous card; it's definitely one that the recipient will be proud to display in their home. Your card is absolutely beautiful! Happy World Card Making Day!!! Awesome card, Miss Kazan!!! Happy WCMD!! Beautiful card! What an awesome giveaway! I just visited my friend Chris' blog, and she use the Brayton font for her title! It's a gorgeous font! Thanks for a chance to win! Happy WCMD! Very very beautyful card! Love it! Beautiful card! I love what you did with the birdhouse. Thanks for sharing! Holy cow, Kazan! What a GORGEOUS card! SO STUNNING! Love how you added the birdhouse next to the circle sentiment-brilliant!!! Absolutely beautiful!!! And that bow...WOW! A lovely card! Thanks for sharing. This card is absolutely stunning!! I love the big yummy bow. well this is just scrumptious..LOOOOVE it! Hi Kazan, love your birdhouse card, the image looks fab and that scrumptious big bow sets it off perfectly. Happy WCMD! What a beautiful green card. That card is absolutely gorgeous!! And an awesome prize, my fingers are crossed. wow, love your card. That bird house is so neat. That is some serious blog candy. Yay! Love Love Love the World Card Making Day Sketch! I had a great time with it! Thanks! I love your card! It has such a rich and traditional feel to it. Love the way you use ribbon. What a gorgeous card- love the little cardinal! Happy WCMD! Your card is just amazing!!! I have had fun checking out everyone's work!!! I love your card, thanks for such a great blog hop. Happy WCMD! You guys are awesome!!! Amazon card its very elegant I love it! Love your card...it's just my style. Gorgeous card! And thanks for the chance to win - I love Just Right products! GREAT CARD !! LOVE IT!! Absolutely beautiful card! Thank you for your endless inspiration! That's a classic beauty! What a graceful and pretty card! Beautiful card - as always!!!!! WOW what a fabulous card. So pretty!! Those stamps look terrific..I need to seriously check those out!! Your card is beautiful, Kazan! Wonderful! What an amazing card! I adore that sentiment! Thanks for the chance to win some yummy candy! Hello from Canberra Australia! I regnised Just Rite's product straight away and HOW I WOULD LOVE TO WIN SOME!! Although I don't own any myself (sigh!) I love seeing the gorgeous cards and projects created with them and yours is no exception! They are in a field of their own!! Thank you for this opportunity to play! God bless you! Gorgeous creation. Love the colours and textures. Wishing you a fab weekend.